It was terrific! Enjoyed every minute of the holiday The Villa was fabulous! 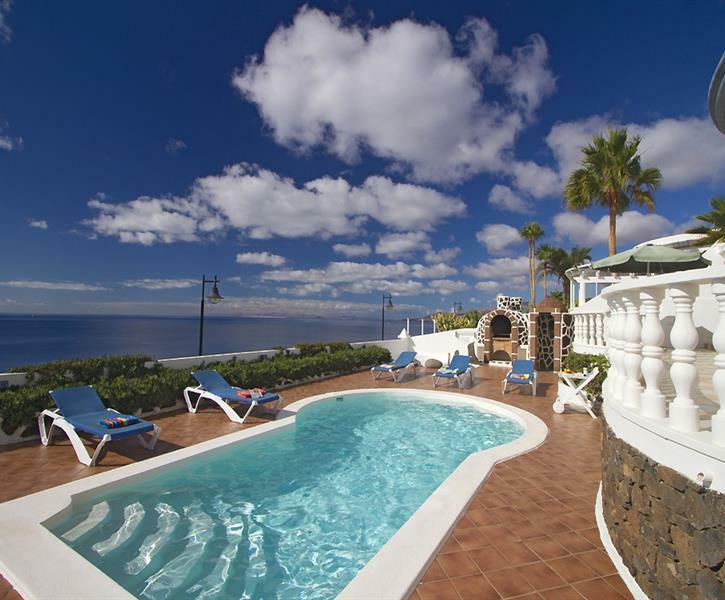 Villa el Sueno is in a perfect location with stunning, panoramic sea and harbour views. 3 bedroom, 3 bathrooms, private heated pool and close to all amenities:. The villa has one double bedroom and 2 twin rooms. Pool is 6.5 x 3.5 approx. and is electrically heated from November to April inclusive. Luxury living in the sun is the reality at El Sueno (The Dream). Everything you could want for a truly relaxing holiday. The villa is spacious with so many different areas in both sun and shade that everyone is happy. Panoramic views out to sea and down into the old town at Puerto Del Carmen from the prominent position, with a pool and large terrace area, make the location ideal to enjoy that lunchtime BBQ, and its only a 10-12 minute walk down the hill into the bustling harbour area with its good variety of bars and restaurants. Everyone you meet is friendly and relaxed and it quickly rubs off on you! The Villa itself has everything you need and more for a very comfortable stay, from washing machine, dishwasher and large, bright lounge overlooking the sea to comfortable bedrooms with plenty of storage and separate bathrooms for each, including a master bathroom with the largest walk-in shower in the world! There is a well-stocked supermarket just a 5 minute, level walk away along with a couple of bars and a very friendly butcher to buy those steaks for the outdoor grill. The rental arrangements were handled flawlessly through both Sue in the UK and the local agents under Erika on the Island, who both went out of their way to ensure that we had the perfect stay. Wonderful! If your looking to relax and chill with veiws to die for this is the villa .This was our first holiday for 23 years and we thought hotel or villa and we went villa 4 the safety of children .Only a few minutes walk to shops restaurants and local buses to all parts of the Irland. We had a problem with internet called management fixed within the day. We found an excellent restaurante called EL PORIL down in the harbour in the very corner we have left cards with directions in villa .looking foward to our next visit.